A trusted advisor, communications pro, executive coach — and strategic, thinking partner…..Eileen Chadnick, ABC, PCC, ACPC, brings more than 25 years of experience to her work as a consultant, trainer, and coach to individuals and organizations. She helps clients tell their stories, build better relationships, and communicate with clarity, positive impact, and results. 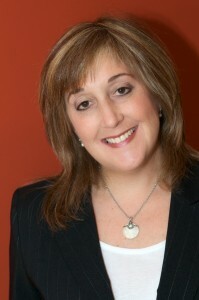 Eileen Chadnick is an accredited business communicator (ABC) and certified coach (PCC, ACPC). She began her communications career in 1990 at global public relations agency, Hill & Knowlton, where she served some of the agency’s largest accounts (Royal Trust/Royal Bank/Royal Bank, Pitney Bowes, Microsoft, Neilson Cadbury, and others). With a track record of break-through success in media and public relations, media training, research and executive communications, Eileen became known as a creative, strategic and dedicated partner helping clients excel in their communication and business objectives (see testimonials). In 1996, she joined Environics Communications as part of the company’s start-up team and later joined CIBC to help lead the PR/communications for the introduction of Canada’s first e-cash, smart card payment platforms (Mondex/ a consortium of 10 banking partners). This work was recognized internationally with prestigious communications awards for excellence in media relations. In 1998, Eileen decided to test her entrepreneurial mettle and was amongst the early wave of professionals to embark in the freelance world, establishing her own independent communications consultancy, Chadnick Communications. Eileen’s client roster at Chadnick Communications has spanned many sectors over the years and she has served a vast array of organizations. Among others, these include: Fidelity Investments, BPI (later merged with CI), Dr. Oetker (launched Ristorante Pizza), Centennial College, Tricon Global, UJA Federation …and many others. Notably, Eileen served Financial Planning Standards Council (FPSC) for 10 years as ongoing, outside PR counsel of record. She established the organization’s first media relations program which she evolved and augmented over 10 years helping FPSC become a recognized and trusted voice of authority for financial planning in Canada and standards for financial planning professionals via CFP certification. Over the years, Eileen has led breakthrough campaigns from strategy through execution helping clients establish, advance, and protect their brands. She has earned prestigious Gold Quill and Ovation awards from International Association of Business Communicators for writing and for high-profile, national (and global) media relations campaigns. *see track record with testimonials and success highlights. In 2003, Eileen added another dimension to her work to serve clients with an expanded toolkit of support. With the introduction of Big Cheese Coaching (and extensive study and certification in professional coaching) Eileen began to work with leaders and organizations to help them develop their ‘leadership-ability’. In this area, Eileen has worked with emerging to senior-level leaders and organizations to further develop leadership talent and capacity, employee engagement, and organizational well-being. Over the years, Eileen has dug deep into the areas of neuroscience, the science of positivity, emotional intelligence, leadership and more recently, the burgeoning field of Conversational Intelligence® (C-IQ® ). She brings the latest in evidence-based science to her practice and years of her own experience to help leaders and organizations communicate better and navigate their work and lives with more efficacy, ease and success. Eileen has been recognized for her excellence in leadership coaching with the coveted Prism award bestowed by the International Coach Federation for a company-wide engagement coaching program. Communications is not a stand-alone service. Today Eileen bridges the tools and offerings from her two ‘sister companies’ to help organizations, leaders and talent (across the spectrum of sectors and experience) develop more robust communications and leadership efficacy — from the ‘inside-out’. Three Pillars — Eileen’s offerings come from three integrated pillars of focus: Leadership; Engagement and Culture; and Communications. 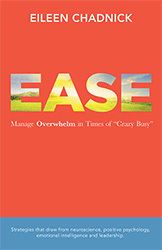 Author and media contributor: Eileen is also author of the Book, Ease: Manage Overwhelm in Times of Crazy Busy. She has also been a contributor to the Careers section at the Globe and Mail since 2007. She authors a blog at the Huffington Post and is also a frequent spokesperson bringing insight to a variety of other media on topics related to communications, personal, professional and organizational well-being. Training and Credentials: Eileen holds the ABC (Accredited Business Communicator) designation from the International Association of Business Communicators. Additionally, she earned her coaching certifications from the Adler School of Coaching (ACPC) and the International Coaching Federation (PCC). Eileen holds a Bachelor of Education from McGill University, majoring in fitness, as well as Marketing Certificate. Earlier in her career taught fitness and wellness (for eight years). Eileen is also certified in the EQi2.0 and EQi 360 programs; and has additional certifications and training related to neuroscience, positivity science, and more. Of course there’s more to the story. And since everything starts with a conversation…..we should have one. Care to connect and share some of your story?